It would have been helpful if The Post went as far as telling its readers what we’ve been finding. 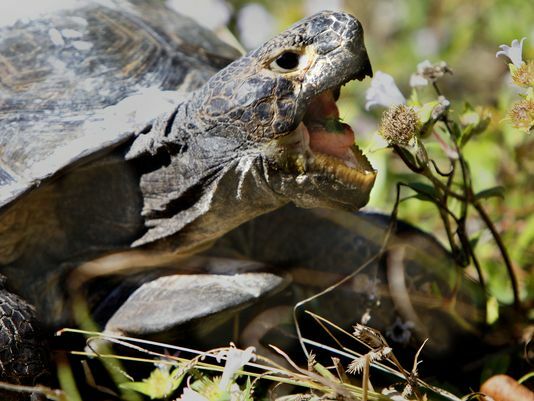 First off, the number of gopher tortoises noted in the initial permits for the site was 12. 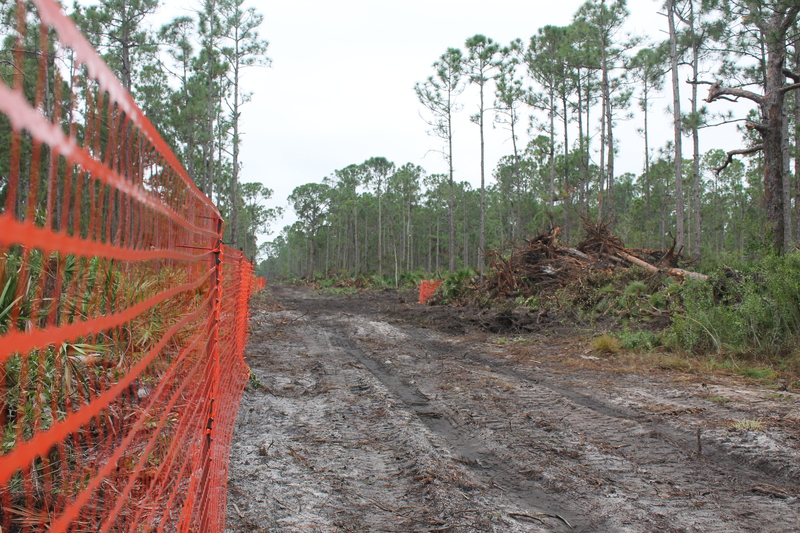 Now that clearing land has begun on Briger, and the developers know that Everglades Earth First! and the Palm Beach County Environmental Coalition have been collecting data (and using motion-detecting cameras which, I might add, are much more reliable for detecting wildlife than supposed “snake-sniffing dogs”), they have admitted to the presence of 75 tortoises in the area where the current work is anticipated to have an impact. This new information places the actual number of burrows in Briger at likely over a hundred, with each one providing habitat for literally hundreds of other species — including some of Florida’s most endangered critters. It’s also worth noting that gopher tortoises are on the brink of being uplisted from “Threatened” status to “Endangered,” for the exact reason of developments like this. The scaly but somehow cute gopher tortoise may be on the fast track for the endangered species list. The gopher tortoise is one of nearly 150 animal and plant species proposed for the next round of Endangered Species Act additions, which is overseen by the U.S. Fish and Wildlife Service. Twenty-three new species have been added for FWS consideration: a honey-eating bird found on two islands in the Samoa region of the Pacific Ocean, 18 flowering plants in Hawaii and four species of fern, also found in Hawaii. 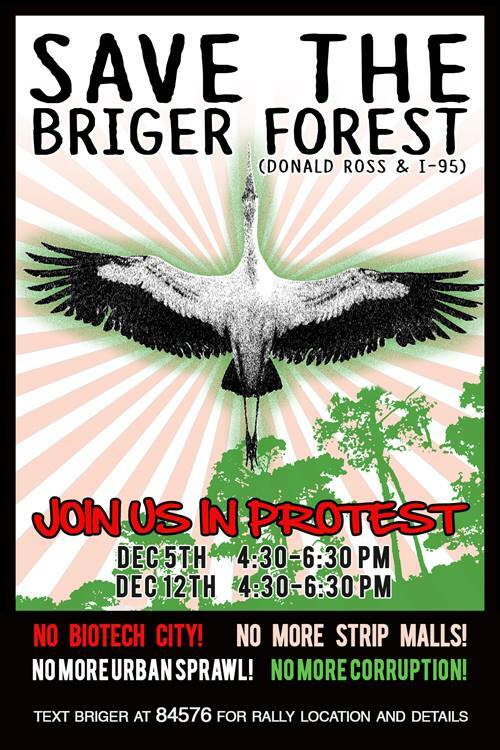 On Friday, December 5, over 50 activists gathered for a rally outside of the Briger Forest in Florida’s Palm Beach Gardens. The group was protesting the Scripps Phase II project, which is currently clearing the 681-acre forest for the construction of a bio-tech city, complete with animal testing labs and shopping malls. The Briger Forest is a unique mosaic of scrub, flatwoods and wetlands. Florida has more endangered and threatened species than any other continental state, and the habitat found in the Briger Forest is increasingly rare, as so much of Florida’s southeastern corridor has been paved over for development. There are at least 13 species of plants and animals listed for protection likely present in Briger. Holding signs urging others to “Stop The Cutting” and “Protect Our Forest,” dozens gathered Friday afternoon to voice their opposition to construction at a 681-acre forest that is one of the last undeveloped stretches along Interstate 95 in Palm Beach County. About 35 people gathered at the Briger tract site, at the corner of Donald Ross Road and Central Boulevard, for a protest organized by the activist environmental group Everglades Earth First! The group contends that the Briger tract is home several endangered and threatened species, including the gopher tortoise and the Eastern Indigo snake. The land should be kept wild, protesters said Friday. 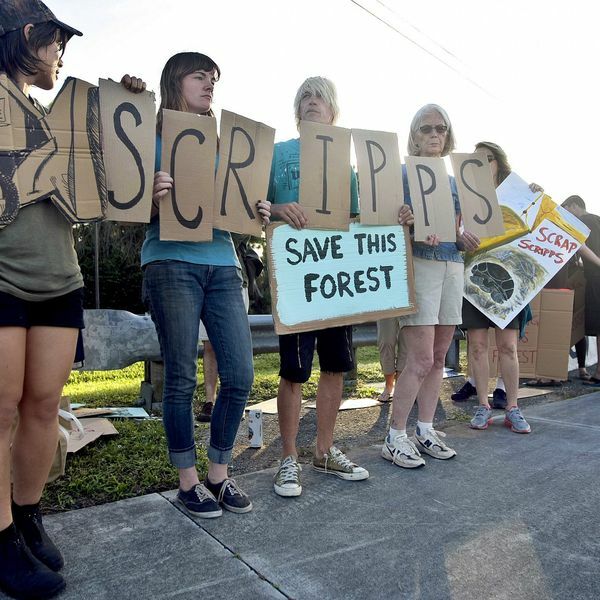 Lake Worth resident Ryan Hartman, a volunteer with Everglades Earth First!, said the group hoped Friday’s protest would raise awareness about the forest, across Donald Ross Road from the Scripps Florida campus. Palm Beach County assembled the tract several years ago to meet the residential and commercial needs created by Scripps’ arrival, including new biomedical companies or spinoffs the institute attracted. Palm Beach Gardens officials already have approved a Kolter Group plan to build 360 houses and townhomes there, and a development arm of the Florida Crystals sugar company has proposed building 361 luxury apartments and townhomes at the site. West Palm Beach resident Carmen Enze, 48, and her daughter, Iris, were among those joining the protest. As the group held signs, waved flags and waved as drivers of some passing cars honked their horns, Palm Beach Gardens police officers kept close watch nearby. But the protest was held mostly without incident. Hartman said that Everglades Earth First! group will hold another protest near the construction site next week, and may hold others later this month. “The more people that see us and go to our website or come out and join us, then the more people we have sign petitions, go to City Council meetings or to protest,” he said. The last remaining unprotected forest east of I-95 is being illegally cut right now. Activists and concerned citizens from all around will be gathering at 4:30 on Friday, Dec. 5th and 12th, at Donald Ross and Central Ave in Palm Beach Gardens to protest its destruction and help save it from the corporate interests who fail to see its value and beauty. This 681 acres is currently home to several threatened and endangered species, including the gopher tortoise and snowy egret. It is slated to become home to more strips malls, more residential units and a biotech city complete with animal testing labs. More corruption – 3 of the 7 County Commissioners who voted in favor of Scripps Biotech have gone to federal prison for development-related charges! Make a left (north) onto Central Blvd. At the roundabout follow the signs to Main Street. Public parking is plentiful a little ways down. If you have your car parked by 4:00-4:15, and we will be offering offer shuttles from your car to the protest. TEXT “BRIGER” TO 84576 to find out more.